By Claudette Gaudet Saap, June 2008. Claudette is the author of Sailors & Rattling Teacups, A History of the Chester Yacht Club. Since the sea gives Chester its character, sailing naturally occupies a position of importance here. Yacht racing has been a major summer sport in Chester for well over 150 years. Its roots are firmly planted in the mid 19th century when the fishermen raced each other to markets in Halifax or New England. As sailors and fishermen have been wont to do since time immemorial, they loved to get together and talk shop. Sailing races for pleasure and bragging rights was inevitable. As the gatherings and races occurred more regularly, the Annual Fishermen’s Regatta was born. The regatta was a show case for locally built boats of different designs, as well as for sailing skills. The first documented regatta was in 1856. It is reported to have been attended by 3,000 people who participated in a parade, amusements, land races as well as the sea races. In 1858 a rowing race for ladies was added and a dance took place at the Mulgrave Inn which had been hosting guests from Europe, US and Canada since 1820. In 1860 the press reported the regatta pleasures were “enhanced by a large party consisting of 150, accompanied by the city band, who arrived in the steamer ‘Neptune’ from Halifax”. In 1885 the two day regatta had boats from Mahone Bay, Lunenburg as well as from the two Tancooks. The big excitement was a circus which featured a hand cranked Ferris wheel on the parade ground. According to the Lunenburg newspaper, the 1888 Annual Regatta attracted 2,000 spectators who were treated to “the closest and most exciting match of its kind ever witnessed in the South Shore”. After CYC was established in 1902, it became the focal point for racing. Charter member Ned Fader remembers, “Citizens donated prizes: 100 pounds of sugar, a barrel of flour, maybe a little cash. A boat crew could get a wonderful view on life for a dollar … best of ale, fifty cents a gallon, good rum at one dollar a quart. They were all good God-fearing people, but they did not let it spoil their lives too much.” In 1902 there were 5 classes for racing yachts based on the old Rater Rule (water line and sail area) As interest increased and designs evolved, competitive requirements led to more classes, designs and sizes. And so it shall always be. In 1903 Hackmatack Inn brochure claims that during Regatta Week competition attracted boats from Halifax, Yarmouth, Sydney and Digby yacht clubs. The annual cruise to Chester enhanced the fun of racing. Race starting line was in the Front Harbour for a few years, however but that soon proved to be too narrow. It was moved to the Back Harbour where it remained until 1926 when CYC acquired the present Club House and wharf. There were slow years during World War I but the Twenties were years of great Chester racing successes. 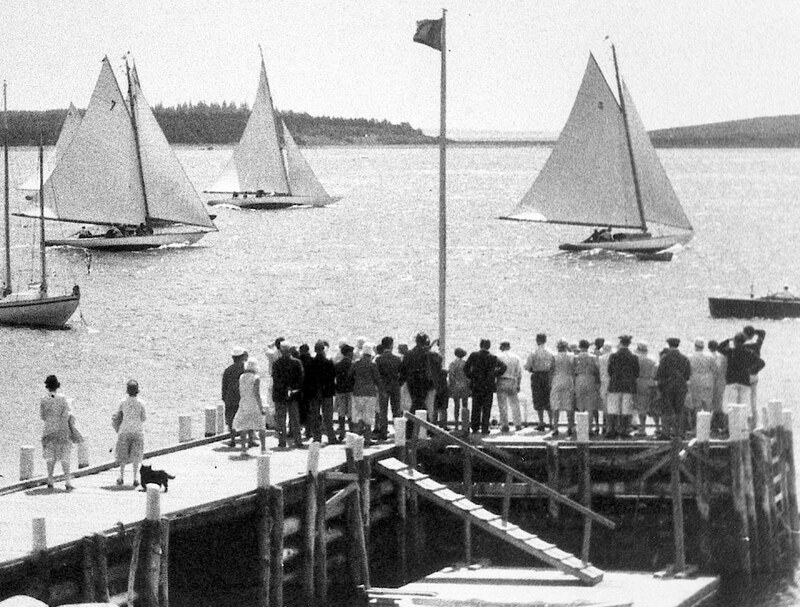 The competition between Chester yachts and those of the Royal Nova Scotia Yacht Squadron was intense and it continued throughout the Depression and the rest of the Thirties. World War II years closed RNSYS and seriously disrupted Chester Yacht Club with decreased membership and funds. The Club stayed open but big yachts and men were mostly absent. Rationing of fuel and other necessities limited provincial travel. By 1945 folks were returning to Chester and inter club racing. Chester yachts cruised to Halifax for their big open cup competition. RNSYS returned the favour by accompanying the yachts back home. For the first time since the turn of the 20th century there were four clubs competing in Regatta Week. Yachts from Bedford and newly formed Armdale Yacht club joined RNSYS. The competition was keen. The Visitors’ Cup was won by a Halifax skipper in “Restless” one of the Heisler Chester C’s. Chester continued winning most of the trophies. The difficulties of two world wars and a major depression left their mark, and by the 1950s Regatta Week was much diminished. The Members were keen to restore the fun of a “Race” Week. They enthusiastically and successfully promoted the big Race Week regatta. More yachtsmen from LaHave, Lunenburg and the two Halifax Clubs participated. 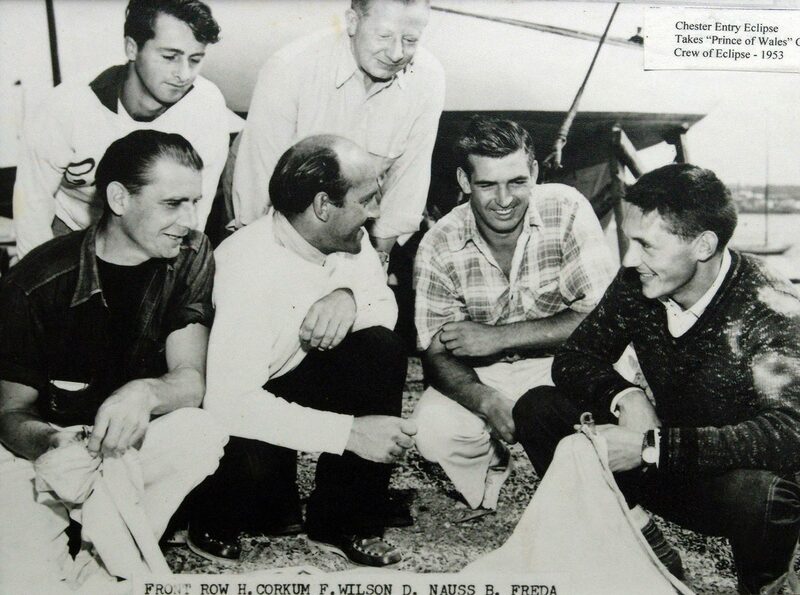 In 1955, the visiting yachtsmen for Race Week were entertained by 20 members, in their homes or at their costs. The Club had finally been granted a liquor license in 1952. There should have been less need to entertain at Members’ respective homes, but the greater club house entertaining was demanding of volunteer contributions of time and material. Cooks and bar tenders were hired. An annual cruise to Lunenburg had been a regular event since before the Lunenburg Yacht Club was officially established in 1948. Now it was becoming a major celebration (Prince’s Inlet Race) at the end of Race Week. This consisted of a morning race from Lunenburg followed by a race of the entire Race week fleet back to Lunenburg. The early Fifties had between 15 to 25 participants by the end of the decade the average participation had mushroomed to 40. By the Sixties change was the rule of the day. As wooden boats disappeared, the number of fiberglass boats grew. Race courses, rating systems, trophies and classes of racing yachts changed. The former First class was divided into A1 and A2. Second class became B and Third became C. As usual Race Week was the highlight of the racing season and the racing committee was keen on increasing participation. In 1964 after much deliberation and consultation with local racers as well as with those from other clubs, Chester Race week was fixed for the third week of August, all boats were in the water by then and crew availability was good. This event would make Race Week even more attractive to local and visiting sailors. That year, enhanced by the perfect weather, at least 16 boats crossed the line for every race. The previous year, the most valuable trophies had been contested by no more than three boats. Three years later as part of the 1967 Centennial celebrations, Race Week was scheduled for July. Race Week was a disaster but a July Race Week will definitely not happen again for one hundred years! By Claudette Gaudet Saap, June 2008. Claudette is the author of Sailors & Rattling Teacups, A History of the Chester Yacht Club.